Another Christian drama from director Alex Kendrick ('Fireproof') is planned for Blu-ray in January. 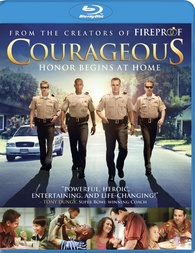 In an early announcement to retailers, Sony will be bringing 'Courageous' to Blu-ray on January 17. As law enforcement officers, Adam Mitchell, Nathan Hayes, and their partners willingly stand up to the worst the world can offer, yet at the end of the day, they face a challenge that none of them are truly prepared to tackle: fatherhood. While they consistently give their best on the job, they quickly discover that their children are beginning to drift further away from them. When tragedy hits home, these men are left with a newfound urgency to renew their faith in order to become closer to their children. Will they be able to find a way to serve and protect those that are most dear to them? The Blu-ray will feature 1080p video, a DTS-HD Master Audio 5.1 soundtrack, and supplements include: Commentary with co-writer/director Alex Kendrick and co-writer Stephen Kendrick, Deleted scenes, Outtakes and bloopers, Courageous in 60 Seconds feature, and Three behind-the-scenes featurettes. You can find the latest specs for 'Courageous' linked from our Blu-ray Release Schedule, where it's indexed under January 17.